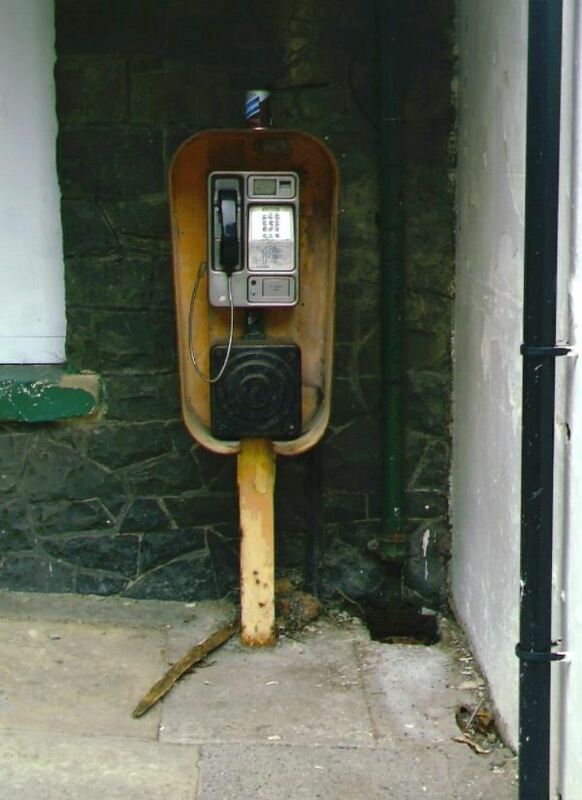 Thanks to @RichardHesketh1, it's of his over growing local payphone. Unusual picture. Let's hope is does not become the usual sight. Real neat addition here. You'll get an interesting answer to this. It could be anyone from anywhere in the world. The payphones are positioned right next to the baggage reclaim belt. It is the very first of 5 when you come from the plane. The phone booth where Travis made his call for help is still there after 35 years. Payphone are not what you once thought they were for. A sticker above a payphone offering many free services, among them Psychic Readings... All for free! Just a little something I spotted for the first time. The payphone can be found on Cavendish Square just off of Oxford Street in London. These payphones don't accept incoming calls so didn't bother to note it's number. Not actually a payphone I know. But it is callable and stands in the street. 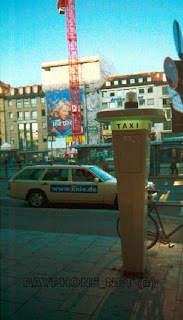 You'll also see that this post contains an old picture of the exact some Taxi Rank. The picture had been recovered from the old "payphone net" site. 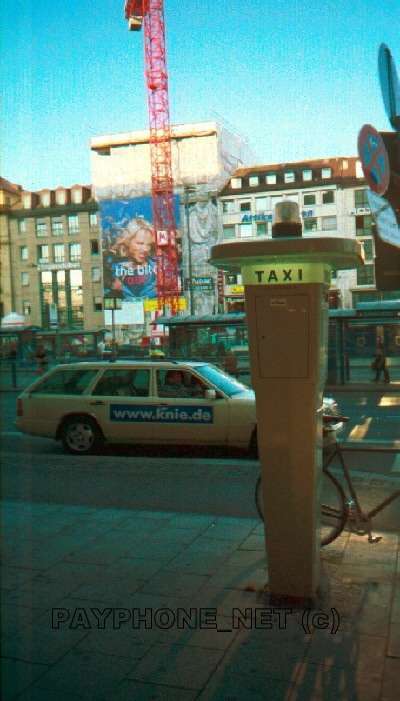 Is very interesting, as the Taxi Stand has been replaced and you can see the old as well as the new one here. When calling this stand, all kinds of lights start flashing, and you'll get some eager taxi driver running to answer the call in the hope of a good job. Have fun. Another cool then and now post. Call this Taxi rank at any time, there's round the clock raw of Taxis waiting for a call on this stand. Just a little something for those interested. Here are two pictures of two differently formatted payphone information cards. You'll see either of these in all official T-Mobile payphones across Germany. Nice phone box here. It stands not very far from the house Mozart lived in the famous place. The main street leads to this square. I was not able to get a working number. And the information card had these numbers listed +43662 421 but that does not make up a working number. Calling my mobile from it got no joy either. Unusual Phone Box (Telefonzelle) in Salzburg, Austria. On the outside seems like just another phone box in this beautiful place. In one of the shots you can see two great big speakers in the phone box! If anyone knows the genuine use of these please comment on this post. What are the chances of this phone booth being stolen? This picture is taken at Beijing National Stadium in China by Brian Farnsworth. 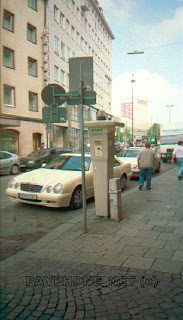 "The Birds Nest" Precast Panels were set in place to offer shelter from weather when using this public phone. The Chinese characters shown on the outside of the panel looked to be bush hammered in using templates. Nice idea, this phone booth is not going anywhere in a storm. This is what happens when a person has used cell phones for way too long when they try to use a payphone. 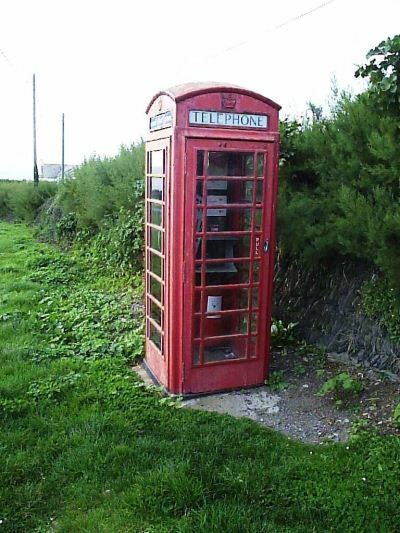 This is a rare example of a working BT Booth 7A, also known as an Oakham Booth as its shape resembles that of an Oak ham tin. This type of Booth was used by BT in areas of high vandalism, such as areas where the normal Kiosks were set on fire etc. This example although functional is in terrible condition, and the area by the station where it is situated is dark and isolated, not a phone I would personally use alone in the nigh time. 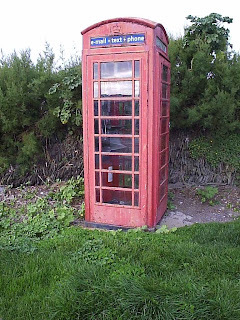 This phone box is at the top of a car park close to the beach. A real addition to the site and the first from an airport, actually from inside. Past security in the departure lounge stands this payphone. In the picture you can see to the left is a internet access centre (very expensive one too). You'll get the attention of anyone sitting here. Wish them a good holiday. Quite a big addition here from Munich, Germany. These payphones receive quite a bit of use actually. in the time that I were there I saw 10 people in as many minutes. I also took a picture close up of the two different models of payphones. They are the ones I've come to know in Germany, perhaps in use for at least the last 10 Years. I posted their listed telephone numbers, but unfortunately you are unable to call payphones.